Cigna Corp. reported stronger-than-expected profit in the first quarter, but the health insurer's stock fell Friday after the company hinted that its proposed tie-up with Anthem may not get regulatory approval this year. Cigna's disclosure came just a few days after Anthem announced that its longtime Chief Financial Officer, Wayne DeVeydt, was resigning. However, Anthem said DeVeydt was leaving to spend more time with his family and to do charitable work, asserting that his departure had nothing to do with Anthem's pending financial matters. Over the past several months, executives at Anthem and Cigna have repeatedly said they expected to complete their proposed deal in the second half of 2016, depending on when the Justice Department and state insurance departments finish their antitrust reviews. However, a regulatory filing released Friday raised the idea that the in-depth evaluations may push back the timeline until next year. The Justice Department, which also is reviewing Aetna's acquisition of Humana, declined to comment. The department will have the final say, although state insurance departments could also foil the deals if they find that health insurance markets in their states would become severely anti-competitive after the acquisition. California will be a key state to watch in the Anthem-Cigna review, where the two insurers have considerable overlap in the employer-based market. California's Insurance Commissioner, Dave Jones, publicly reviewed Anthem's acquisition of Cigna in March. Health economists found that fully and self-insured employer markets would be more consolidated (PDF) in several state counties following the deal, depending on the type of plans that are offered. During an earnings call last month, Anthem executives reaffirmed their faith that the transaction would get final approval this year. Anthem recently pegged the current value of the deal at about $53 billion, including debt. Even though the Obama administration has nixed several corporate mergers in the past couple of years, most recently blocking the tie-up between oil giants Halliburton Co. and Baker Hughes, Wall Street analysts also have been extremely optimistic that federal and state regulators will give their blessing to both insurance mergers. But hospitals, doctors and consumers have advocated fiercely against them, and believe there is no such guarantee. “We continue to believe DOJ is likely to approve the transaction with minimal divestitures,” J.P. Morgan analyst Gary Taylor, who met with Anthem executives Friday morning, wrote in a note to investors. 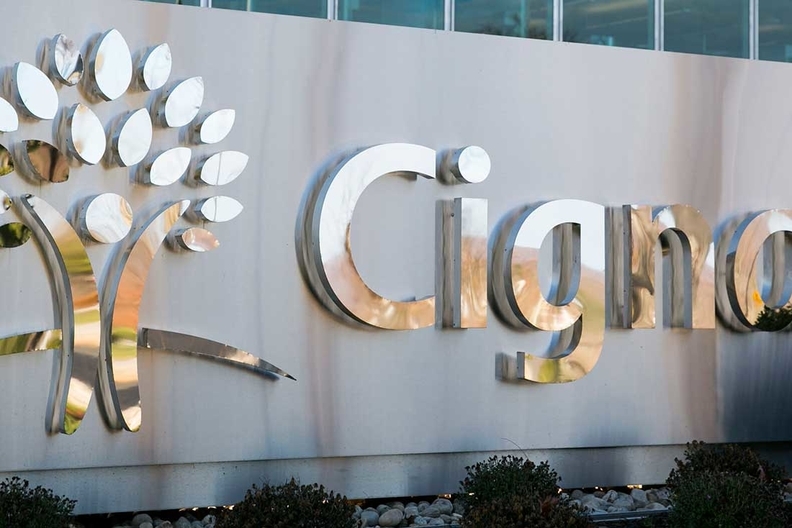 Cigna's net income in the first quarter dropped 3% but still totaled $519 million. Quarterly revenue increased 4% to almost $9.9 billion. Most of Cigna's business comes from companies that offer coverage to their employees. The company ended the quarter with 14.5 million medical members worldwide, including 193,000 beneficiaries who bought plans on and off the Affordable Care Act's individual exchanges. However, Cigna has a growing interest in Medicare Advantage. During the first quarter, the CMS made a huge policy shift tied to Medicare Advantage's star ratings that directly benefited Cigna, leading some to speculate that the change was made because of Cigna's influence.